response from property - Apr 09, 2019 Hi Dale, Thank you for the 4-star rating! We are happy to hear that you would call Carlyle Place home again. Please let us know if there is anything we can assist you with in the future. Sincerely, Ashleigh N.
I would look elsewhere.submitted by Simon C. - Apr 01, 2019 |Recommended: NoWe have complained about the lack of insulation, and there has been nothing done. response from property - Apr 10, 2019 Simon, We are so sorry to hear that we haven't met your expectations and want to apologize for our delayed response. Our community has double paned windows, but we recognize that during the winter months especially on extremely cold days it can still get cool in the apartments, which is why we encourage residents to keep their heat on to ensure their is proper air circulation. We want to see if there is anything else we can help you with, would you be open to having a conversation with our property manager? We would welcome an opportunity to speak with you to see if there is anything we can do to mend this relationship, we hope you will give us this opportunity. Sincerely, Taryn s.
Great apartments - Great valuesubmitted by Elizabeth S. - Jan 28, 2019 |Recommended: YesCarlyle Place has been a fantastic place to live so far. This is our second apartment in Alexandria, and we have been more than happy here, and hope to call this home for many more years. Everyone from the front desk staff, leasing, management, and most of all maintenance has been very helpful and professional. The apartments offer great floor plans and space, and the location cannot be beat. response from property - Feb 03, 2019 Hi Elizabeth, Thank you so much for your positive comments about Carlyle Place! We are so happy that you have had such an amazing experience at our community! We will make sure to pass along your comments to the team. Please let us know if there is anything else we can assist you with in the future. Sincerely, Ashleigh N.
Great Property. Convenient location. Excellent Service.submitted by James M. - Jan 18, 2019 |Recommended: YesI've enjoyed living at Carlyle Place. The building and facilities are great but it's the service the staff provides that make the experience one of the best I have had. response from property - Jan 25, 2019 Hi James, We are so happy that you have had such an amazing experience at our community! We will make sure to pass along your comments to the team. Please let us know if there is anything else we can assist you with in the future. Thank you for calling Carlyle Place home! Sincerely, Ashleigh N.
response from property - Dec 14, 2018 Hi Janelle, Thank you for the 4-star review! We are happy you enjoy calling Carlyle Place home! Sincerely, Ashleigh N.
Overall property is good, the plumming is down right terriblesubmitted by Daniel W. - Nov 19, 2018 |Recommended: NoThe pluming in this building is the worst I have ever seen. We have dealt with various pluming issues since the day we moved in. I would not recommend moving into this apartment complex. The rest of the place is good and convenient, but does not outweigh the pluming issues we continue to have. Stay far away from this place. This is what I would currently say to anyone that ask me about this place until we get out pluming fix. I will soon leave a very negative review on google and anywhere else if our issue is not resolved very very soon. response from property - Nov 21, 2018 Thank you for sharing your honest feedback of our community. Our Property Manager has been in contact with you regarding the plumbing issues you have been experiencing and we will continue to keep you informed on the steps we are taking to correct the issue. We have hired professional plumbers on several occasions to try to determine where the issue is stemming from. We want you to know that we take your concern very seriously and are committed to finding a resolution. We understand that this has been an inconvenience and source of frustration for that we want to sincerely apologize. Our Property Manager will continue to reach out to you directly to discuss our plans to address this issue, but of course if you would like to speak with her before then please feel free to reach out to her at 703-706-0076. Great apartment building convenient to Eisenhower metrosubmitted by Michael R. - Sep 20, 2018 |Recommended: YesI lived here for a year and enjoyed my time here. I was transferred to the DC metro area for the military and the staff were very accommodating of military members. They were easy to work with and friendly to work with it. I loved having the FEDEX store, Deli and Barbershop located on the ground retail level. The pool was kinda of shaded because it is sandwiched between two apartment towers, so that is a warning for the sun lovers that use the pool frequently. I would also recommend have better grilling equipment. I worked with Asad Khan a lot at the front office and he was great to work with I highly recommend him when you are inquiring. response from property - Sep 21, 2018 Hi Michael, Thank you so very much for such a positive review and for sharing your experience with our community and team! We're glad to hear we delivered such a great experience and we are happy to pass along your comments. We truly value and appreciate your feedback. Please do not hesitate to let us know if we can be of more service. Sincerely, Ashleigh N.
Very Nicesubmitted by Javier A. 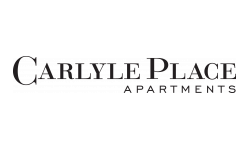 - Aug 30, 2018 |Recommended: YesCarlyle Place Apartments is a very community to live in. It has all the amenities you would need and the staff is very friendly and knowledgeable. response from property - Aug 31, 2018 Hi Javier, We are happy to hear that you are enjoying your experience at our community! Thank you for the positive review and for choosing to call Carlyle Place home! Please do not hesitate to let us know if we can be of more service. Thank you, Ashleigh N.
It's pretty good but...needs leasing office customer service improvementsubmitted by Angelia S. - Jun 28, 2018 |Recommended: YesConvenient to most everything and pretty quite. response from property - Jul 03, 2018 Hi Angela, Thank you for taking the time to review our community. We are happy to hear that overall you enjoy calling Carlyle Place home however, we are disappointed that your recent experience with our team has been less than ideal. Our property manager would like the opportunity to speak with you further regarding your review and the concerns you have. Please contact her at 703-706-0076 at your earliest opportunity. We look forward to speaking with you soon! Sincerely, Ashleigh N.
Walking Distance to Old Town, But Otherwise Averagesubmitted by Benjamin H. - May 14, 2018 |Recommended: YesThe building is in a good location, and the staff is friendly and generally helpful. Every month a local restaurant offers a discount to residents, and the building has a dinner or ice cream party or pizza night every month. There is a small 24 hour gym. It has about 10 treadmills and some weights. I've never seen more than 10 people in the gym at any time. There is also a club room with a tv, pool table and kitchen. I don't use the club room much and the tv wasn't working the last two times I was there. There is a parking garage with three levels reserved for residents. Navigating the garage can be difficult because cars use the same ramps to go up and down, and because there is only one exit, but cars approach it from multiple directions. There are two elevators in my building, and one of them also serves as a freight elevator, which can be reserved for private use. This can be very frustrating, and can cause very long wait times for the elevator I had to wait for more than five minutes on one occasion. Maintenance is generally prompt, but they also seem to prioritize easy jobs that can be resolved quickly. I would recommend, but not at the current price. response from property - May 17, 2018 Hi Benjamin, We sincerely appreciate your feedback and thank you for taking the time to share your thoughts with us. Our team had heard that residents sometimes struggle with the TV in the Clubroom, because it does take a few minutes to turn on. It is working properly and we would love to show you how to use it so that you can enjoy the Clubroom space more regularly. Our maintenance team strives to complete all work orders within 24-48 hours depending on the need of parts. If you are experiencing any specific maintenance issues, we are happy to help. Please reach out to our management team at 703-706-0076. Sincerely, Ashleigh N.
Very Nicesubmitted by Mikhail F. - May 07, 2018 |Recommended: YesThe community is very nice was meant to be a set of condo's, but converted to apartments. The building has a quiet elegance. The gym is decent, and I've rarely had to wait to use weights or any treadmill. Location is great if you work in Maryland, and is directly across from the Eisenhower metro access to the city, if you need or want to . My one critique there's no place to sit outside when the weather is nice. The pool, like all in the area, is open for a narrow time, but the area where you could sit and enjoy the sun is only open when the pool is open. Would be nice if the complex either opened the seating area, or created one. Very nice place to livesubmitted by Joshua Y. - Feb 01, 2018 |Recommended: YesIt is expensive compared to other apartments within the area. That aside, the property is always clean, the staff is friendly and maintenance is quick to respond to issues. The location is nice with easy freeway and metro access. response from property - Jun 02, 2017 Thank you for taking the time to submit a review of our community and for sharing your concerns with us. We strive to offer excellent customer service and want to sincerely apologize for any miscommunication you may have experienced with regards to your lease changes. We are dismayed to hear that your time at our community has been less than pleasant and would like the opportunity to mend our relationship with you. Our leasing team has reached out to you directly to explain the lease renewal or cancellation process, but please do not hesitate to contact our property manager directly at 703-706-0076 should you need immediate assistance.